Browse our large choice of premium slush machines and equipment from the leading genuine worldwide brand Sencotel. 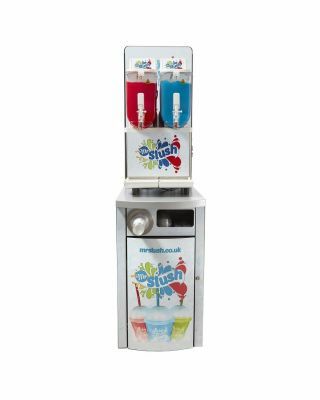 The majority of our slush machines are supplied with various starter pack options and an on-site parts and labour warranty too. All our slush equipment is built with reliability and performance in mind and available in a variety of size and capacity options; from 5ltrs per slush tank, up to 12ltrs for the most demanding establishments. Be sure to check out our slush machine bundles, which include enough slush syrup to pay for your investment when sold. See individual products for Starter Pack Options. Machines come in a choice of single, twin tank and triple tank options. Our slush equipment solution is sometimes referred to as Slush Puppie or Slush Puppy machines but our brand is 'Mr Slush'. Start making big margins delling slush drinks with our unbranded or fully branded Mr Slush machines. Shop online or call us for expert advice and start making yummy slush drinks as soon as tomorrow thanks to our FREE next day delivery. Why sell slush? Slush offers retailers big profits, usually between 80-90% P.O.R or 600% margin return. a 9oz (270ml) slush drink costs 14p to prepare (including the slush syrup, slush cup and straw) and retails at £1.20 on avaerage. Our slush machine customers on average enjoy profits in the region of £6k each year.